The French Quarter is the oldest part of the city, and after almost 300 years it is still a vibrant area. 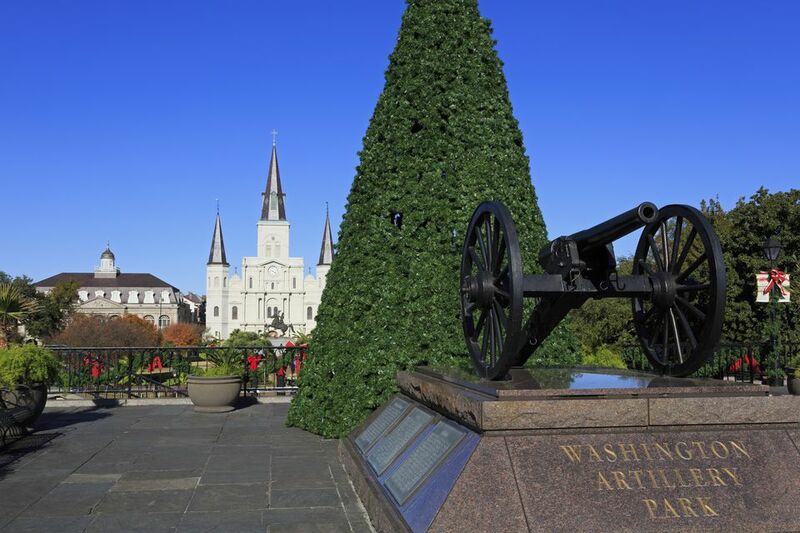 Start your tour of the Jackson Square, named for General Andrew Jackson hero of the Battle of New Orleans, and its surrounds at Artillery Park, located on Decatur Street in front of Jackson Square. From here you can see the Mississippi River behind you and Jackson Square in front of you. The Mississippi was the main artery for trade between Europe and the New World. Jean Baptiste LeMoyne, Sieur de Bienville, was ordered to move the capital of the French Louisiana colony from Fort Biloxi to a location on the River. However, the mouth of the river was dangerous for navigation. The Native Americans living in this area showed Bienville a “secret” way to get from Fort Biloxi, through two area lakes that took them to Bayou St. John. From there, they could easily navigate to this point on the Mississippi. The City was founded in 1718. The Streets of the French Quarter were laid out in 1721. Many of the streets running from the river are named for Catholic saints and many of the cross streets are named for the Royal ​house of France at that time. So Bourbon Street is not named for an adult beverage, but for the Royal House of Bourbon. Two great fires nearly destroyed New Orleans in the 1700s. The first great fire of New Orleans started in the house at Toulouse and Chartres (619 Chartres) when on a windy Good Friday, March 21, 1788, Don Vincente Nunez lit a candle at a religious altar in celebration Good Friday that caught fire. Because it was Good Friday, the bells of the St. Louis Cathedral, normally used to alert the population of a fire, were padded to be silent. 850 homes were destroyed in this fire within 5 hours. The second fire was on December 4, 1794, destroying another 212 homes. After this, the Spanish implemented building codes that included thick brick walls, courtyards, and arcades. Examples of such buildings are the Cabildo and the Presbytere, rebuilt after the 1794 fire. The river itself, the fourth longest in the world, drains 40% of all of America and is over a half-mile wide. Notice that you are actually standing on a levee. These levees were originally about a foot high and formed naturally; Bienville ordered they be raised to three feet. After that, the French riverfront landowners were to build and maintain levees at ​peril of losing their land. Crevasses, or breaks in the levees, occurred during floods and caused casualties to life and property. After the Americans bought Louisiana, the levee system was turned over to the Army Corps of Engineers. Witness Hurricane Katrina--the rest is history. When you look out at the Mississippi River, notice how it curves into a crescent to your left. This gives New Orleans one of its nicknames, The Crescent City. The Mississippi continues to be the lifeblood of the City. The Port of New Orleans handles about 500 million tons of cargo each year, and is the largest port for rubber and coffee; in addition, more than 700,000 cruise passengers sail through the port each year. Walk across Decatur Street and go into Jackson Square, an area that has always been a public square since the founding of the city in 1718. It was originally named the Place d'Arms. It was renamed when the statue of Andrew Jackson, hero of the Battle of New Orleans in the War of 1812 was placed there during a renovation in the 1850's. The inscription on the statue was added by General Benjamin Butler, the Union General who was over New Orleans during the Civil War to spite the citizens of New Orleans. During that period, the women of New Orleans crossed the street to avoid passing a Union soldier as a protest of Union occupation. Gen. Butler was not amused. He announced that he would prosecute any woman who did so as a prostitute. After that the women of New Orleans passed by Union soldiers on the street, but began putting pictures of Gen. Butler in the bottom of their chamber pots. St. Louis Basilica, or St. Louis Cathedral, is the building centered behind the square. To its left is the Cabildo, formerly the seat of Spanish rule and now a part of the Louisiana State Museum. It was damaged by a fire in 1988 and authentically restored. On the other side of the Basilica is the Presbytere, former residence of the Capuchin monks, and later a courthouse. Today, it is also part of the state museum system. The Pontalba apartments are the oldest apartment buildings in the United States, having been built between the 1840-50’s. Today, the upper floors remain residential while the lower floors are commercial. 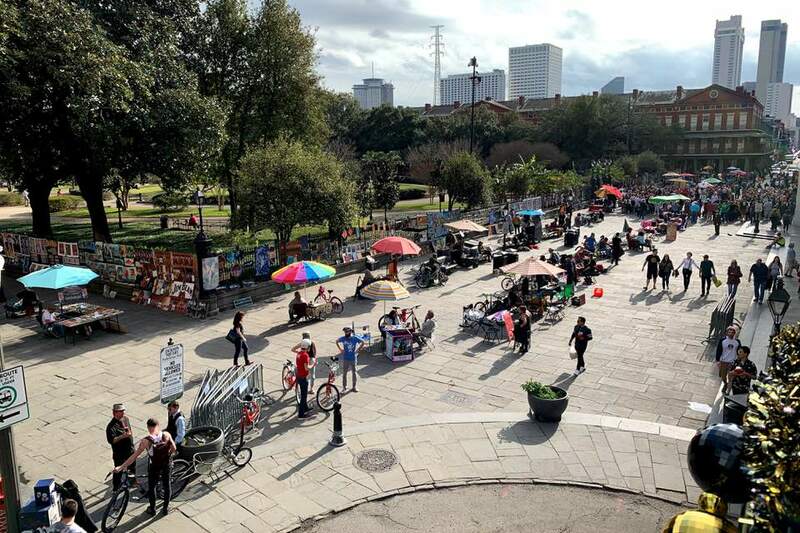 Jackson Square is the heart of New Orleans in modern times, visited daily by locals and tourists, surrounded by artists, street performers, and fortune tellers. It is also a main part of the French Quarter Festival held every April. The St. Louis Cathedral, just outside the Chartres Street gate was originally completed in 1729. It was destroyed twice by fires in 1788 and 1794. The existing cathedral was built after the last fire in 1794. This cathedral became St. Louis Basilica when Pope John Paul II visited in 1984. Notice the two alleyways on the sides of the cathedral. The one on the left, between St. Louis Basilica and the Cabildo, is Pirate's Alley. It is thought to have been named after Jean Lafitte, the buccaneer who fought with Andrew Jackson at the Battle of New Orleans. Also an adventurer, Lafitte was a smuggler who was popular with the locals. After a price was put on his head by the governor, Lafitte in turn put a price on the governor's head. Formerly officially Orleans Alley South, the alley was officially renamed in 1964. It is still paved with the original stones that had served as ballast on ships that cruised the Mississippi, and its central drainage is European in design. Pirate's Alley does not always appear on city maps, but it is an important area in the French Quarter. Faulkner House, where "A Soldier's Pay" was written, is in the middle of the alley. If you walk down this alley, notice the drainage in the middle. This is the Europeon method of water drainage. Since New Orleans is in the Mississippi River Delta, we have no natural stone. The stones used to pave these streets and alleys in the 1700s was ballast thrown on the banks of the river by ships coming in to port and no longe in need of them. The citizens of New Orleans collected thses discarded stones for use in paving. Soon, the captians of the ships became aware of the use and began selling the stones. The alley, between St. Louis Basilica and the Cabildo, is called Pirate's Alley, and is thought to have been named after Jean Lafitte, the buccaneer who fought with Andrew Jackson at the Battle of New Orleans in 1816. Also an adventurer, Lafitte was a smuggler who was popular with the locals. After a price was put on his head by the governor, Lafitte in turn put a price on the governor’s head. Formerly officially Orleans Alley South, the alley was officially renamed in 1964. It is still paved with the original stones that had served as ballast on ships that cruised the Mississippi, and its central drainage is European in design. Pirate’s Alley does not always appear on city maps, but it is an important area in the French Quarter. Faulkner House, where “A Soldier’s Pay” was written, is in the middle of the alley. The alley between the St. Louis Cathedral and the Presbetyre is Pere Antoine's Alley, named for Friar Antonio de Sedella came to New Orleans around 1774. There are some who say, Pere Antoine still haunts the area. The building to the left of the St. Louis Cathedral (as you are facing it) is the Cabildo, built in 1794. The Cabildo is the site where the Louisiana Purchase was signed. It also served as the seat of government during Spanish rule. It is currently used as a Museum that has the death mask of Napoleon in one of its exhibits. If you're facing the Cathedral, look to it's right. There you will see the Presbytere, former residence of the Capuchin monks, and later a courthouse. Today, it is also part of the state museum system. On either side of the square are the Pontalba Apartments built by the Baroness Michaela Pontalba in the 1850's. They are the oldest apartment buildings in the United States. The Baroness is a colorful figure in New Orleans history. She is the daughter of Don Andres de Almonaster y Roxas, who is buried under the floor of the St. Louis Cathedral. Michaela survived an attempted murder by her father-in-law in Paris 1834. She returned to New Orleans 1848 to find the old Creole families were moving to Esplanade Avenue. Seeking to restore this area of the French Quarter, she built her grand row houses, and convinced city officials to renovate the Square, and surrounding buildings to resemble the great public squares in Europe. During construction, Michaela would supervise, often climbing up and down scaffolding checking everything. She constructed the buildings in 2 1/2 years at a cost of $302,000. Walk out onto Chartres Street, past the Cabildo. At the corner of Chartres and St. Peter Street, you will see the Le Petite Theatre du Vieux Carre. Theatrical productions have been given here regularly since 1922, and continue today. It is reputed to be haunted by an elegant man in evening dress. Walk up Chartres Street 1/2 block and look for a pink building with a historic plaque. It is here on March 2, 1788, that Sr. Vincente Nunez was lit the candle that started the fire that destroyed much of the city. Maybe now you're ready for some relaxation, a cup of coffee and chicory, or cafe au lait and some beignets (say, "ben yeahs"). Then walk over to the Cafe du Monde next to Artillery Square and enjoy. The Cafe du Monde has been serving coffee since 1865 and is part of the original French Market. It's open 24/7 except for Christmas Day and the occasional hurricane. Why Is the French Quarter so Unique? Jazz Yoga? Only in New Orleans! Here is where you can do it.